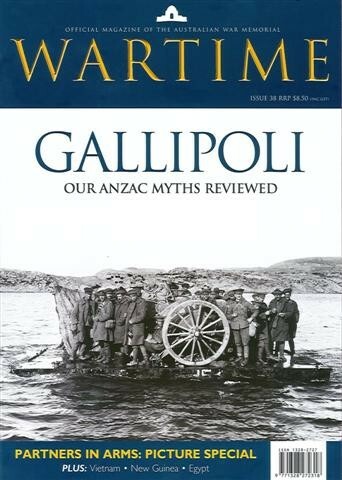 GALLIPOLI: Our ANZAC Myths Reviewed. The real fight for Gallipoli by Peter Hart. A British historian corrects some myths and misconceptions. Was Lone Pine worth it? by Rhys Crawley. The battle at Lone Pine is remembered as Australia's most successful action on Gallipoli but not all who were there would agree. The Turkish perceptive by Harvey Broadbent. Previously unexamined documents in the Turkish archives could lead to a reassessment of Australia's most famous campaign. Heroic sacrifice by Nigel Steel. The 14th Sikhs attracted tributes for their valour and discipline from across the British Empire. No regrets by Peter Burness. A 'stern and demanding' officer's name is forever linked to a disastrous charge. A clerk's eye view by Anne Marie Condé. John Treloar waded ashore at the landing with a typewriter in one hand and a sheaf of paper in the other. What if...? by Nigel Steel. Imagine the Gallipoli landing had succeeded - what then? In the cold light of dawn by Kerry Neale. While the significance of the dawn service continues to grow, questions remain over its origins in Australia. An ANZAC's pay book by Donald Lawie. A pay book and a diary trace a trail from Egypt to France and Belgium. French heroes in Sydney by John Ramsland. A popular Sydney newspaper defined the heroic image of visiting allied soldiers. Partners in arms by Sven Knudsen. The 90th anniversary of the military alliance between Australia and America. 'The toughest battle of all' by Craig Tibbitts. A ghastly nightmare tested Australian soldiers to their limits. Crossing the Busu by Garth Pratten. A raging torrent, enemy on the far bank, no boats, no bridges, no fords, and an operation that must proceed. Beauty in hell by Janda Gooding. A war artist's 'brilliant little flashes' illuminate the landscapes of war. The Light Horse and the lady by John Connor. A chance discovery brings to light paintings of the Light Horse in Egypt.